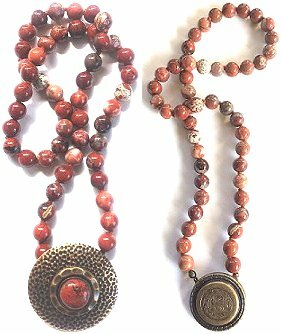 Each 'TTRACTION™ naturally attractive jewelry™ set includes a hand-knotted, 8 mm stone bead necklace and two magnetic ornaments. Wear an ornament as a pendant on the necklace's magnetic clasp or -- by using the horseshoe "back" included in each set -- as a small brooch. When placed on the underside of fabric, our signature horseshoe magnet easily attracts any 'TTRACTION™ small metal ornament or insert. To learn how Cowgirl sets differ from National Park sets click on the images below. Separate-purchase inserts and ornaments for 'TTRACTION™ sets are sold here and in each 'TTRACTION™ shop.